Assortment of 48 mixed yellow and white buckle for leather straps. 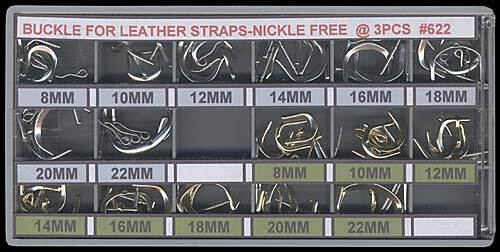 Buckle sizes are 8mm, 10mm, 12mm, 14mm, 16mm, 18mm, 20mm, and 22mm. Yellow buckle: 8 different sizes, 3 pieces each size, a total of 24 yellow buckles. White buckle: 8 different sizes, 3 pieces each size, a total of 24 white buckles.